"When the title Moving Out is applied to this album, it bears no reference to leaving one domicile for another but means stepping out into high gear while playing. Those of you who are familiar with Sonny Rollins' playing know that he does a lot of moving out, stepping out (right out of his shoes) and stretching out (extending himself to play interesting parts of the chords). These are vintage Rollins recordings made in a New York period prior to his year of study and self-evaluation in Chicago. They are from a steadily flowing Sonny who only hinted at future experiments with rhythmic figures and time breaking. That he has matured and become even more personal is evident in his more recent recordings but it is equally evident in listening to the selections in this LP, gathered from two 1954 sessions, that Sonny's talent did not go begging before 1955. 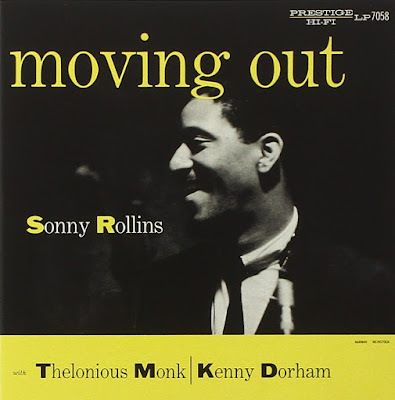 Four of the selections were recorded on August 18, 1954 and feature trumpeter Kenny Dorham in unison with Sonny. At this writing, the two are re-united in the Max Roach quintet. ..."